Here at Lady Clever, we absolutely believe that plastic surgery is a feminist issue. Freedom of choice to decide what to do with her body is integral to a woman’s personal autonomy. That being said, we also believe that the only good choice is an informed one. Read more below from Leia, who gives you an insider’s view into the world of lip injections. Your top lip should never be bigger than your bottom. The “Duck Face” effect is what you get when that top lip rolls over your bottom! Always tell the person administering the injections that two-thirds should typically be in the bottom lip if you don’t want to look like a pond-swimming, breadcrumb-chasing botch case. Know what is going in your body! The product that is being injected should be opened in front of you. I always ask to see what grade of Juvederm I’m receiving so I’m not overcharged. Plus and Ultra Plus are two different products. Restalyne is different, and so is Botox — the medical office should fill you in on those differences. The filler should come out of a box that is clearly labeled, and everything should be sterilized in front of you for safety reasons. Don’t just let them pump it in wherever. You can map out the shape of your lips using a lip liner at home beforehand just to see what your results might be. I tried outlining my Cupid’s bow or the edges to see what looked the most natural — but still full. There are tons of ways to cheat the look so make sure if you’re making a committed step — i.e. the injections — that you have an idea of the final look. Everyone is different, so maybe it’s your sides or center that need more fullness, or maybe you want to fix some asymmetry. I hold up a mirror to follow along during the procedure. This is not for the weak at heart. It is more painful than electrolysis and laser hair removal and getting the tattoos I have on the side of my head! Everyone has a different pain tolerance — but lips are already super-sensitive. A needle in them doing crochetlike motions feels like a SAW movie trap. I’ve tried the numbing cream and tried injections without it. Hurts either way. Do your research! In this day and age, if a place has people walking out looking like Ronald McDonald, you’ll see it everywhere on social media. Yelp, Google reviews, RealSelf, and many others provide first-hand reviews. Ask people who have experience, too. 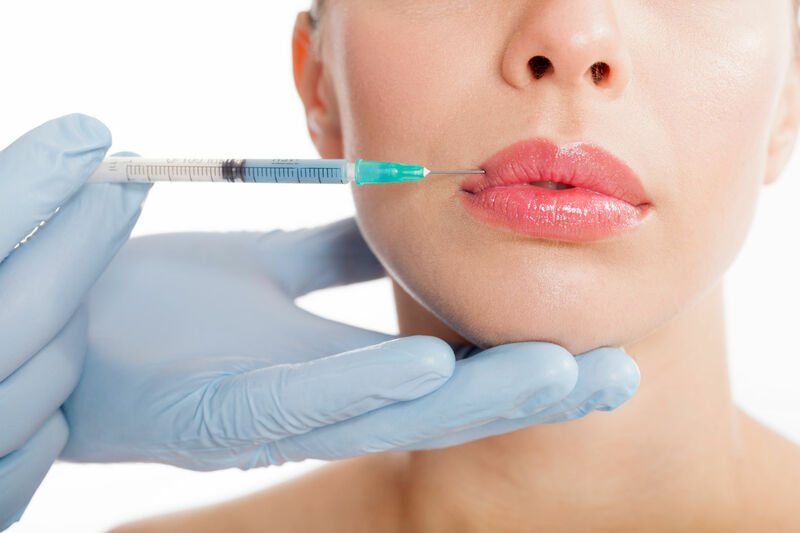 In 2016, plastic surgery and lip injections aren’t as taboo a subject anymore. Typically, I think people overpay, and don’t realize it’s a process to reach a certain size they’re happy with. Which leads me to my sixth point: be realistic with your expectations. Don’t expect Lana Del Rey vibes the first time. You’re going to leave swollen. You’ll either be overwhelmed by how large they are, or in heaven because they look super juiced. The swelling will go down and your “plump high,” as I like to refer to the honeymoon phase of swollen lips, will be over. They’ll be bigger, but not as big as when you initially got the injections. To be honest, it took me four rounds of Juvederm Ultra Plus to get the results I wanted. I actually had to fix symmetry after my second experience didn’t turn out well. Don’t do it for anyone but you. I had a decent bottom lip with no top lip to write home about, okay! To help my male-to-female transition, I thought fuller lips would make me look more feminine — and it worked for me. No one else in my family has really followed me, and I only have a couple of friends in LA who have done it, too. Again, it’s not as taboo as it used to be — just don’t let stigma or pressure get the best of you. These injections are not permanent: remember that you’re not going to look like a walking mistake if you follow these tips.